*According to the Canadian Physical Activity Guidelines for the Early Years (0 – 4 years): Infants (aged less than 1 year) should be physically active several times daily – particularly through interactive floor-based play; Toddlers (aged 1–2 years) and preschoolers (aged 3–4 years) should accumulate at least 180 minutes of physical activity at any intensity spread throughout the day; Children are to progress toward at least 60 minutes of energetic play by age 5. http://www.csep.ca/CMFiles/Guidelines/CSEP_PAGuidelines_early-years_en.pdf – accessed June 21, 2017. **Age 5 use with caution. accessed june 22, 2017; and, Statistics Canada. Health Reports. 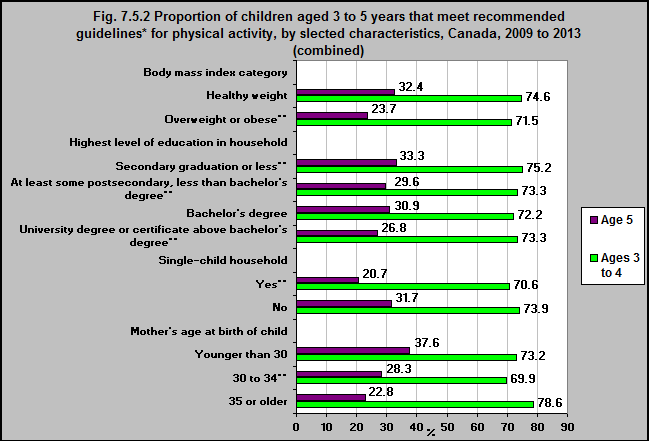 Physical activity and sedentary behaviour of Canadian children aged 3 to 5. Research article, Catalogue no. 82-003-X, Vol. 27, no. 9, pp. 14-23, September 2016. http://www.statcan.gc.ca/pub/82-003-x/2016009/article/14653-eng.htm -accessed June 22, 2017. Between 2009 and 2013, the proportions of children 3 to 4 year-olds who met the recommended guidelines for physical activity (at least 180 minutes of physical activity every day) were: 74.6% for children with a healthy weight versus 71.5% for children overweight or obese and 70.6% for children in single-child households versus 73.9% for children in non-single-child households. During the same period, the proportion of children 5 years old who met the recommended guidelines for physical activity for their age group (at least 60 minutes of moderate-to-vigorous physical activity every day) were 32.4% for children with a healthy weight versus 23.7% for children overweight or obese and 20.7% for children in single-child households versus 31.7% for children in non-single-child households. For more details about these data, including statistical significance, refer to Statistics Canada1.